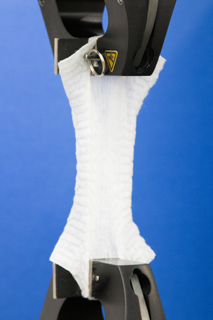 The ASTM D 5034 Tensile properties test method describes the grab and modified grab test procedures for determining the breaking strength and elongation of most textile fabrics. Provisions are made for wet testing. The grab test procedure is applicable to woven, nonwoven, and felted fabrics, while the modified grab test procedure is used primarily for woven fabrics. This method is not recommended for glass fabrics, or for knitted fabrics and other textile fabrics which have high stretch (more than 11 %). This test method provides the values in both inch-pound units and SI units. Inch-pound units is the technically correct name for the customary units used in the United States. SI units is the technically correct name for the system of metric units known as the International System of Units. The values state in either acceptable metric units or in other units shall be regarded separately as standard. The values stated in each system may not be exact equivalents; therefore, each system must be used independently of the other, without combining in any way. A 100-mm (4.0-in) wide specimen is mounted centrally in clamps of a tensile testing machine and a force applied until the specimen breaks. Values for the breaking force and the elongation of the test specimen are obtained from machine scales, dials, autographic recording charts, or a computer interfaced with the testing machine. The test method describes procedures for carrying out fabric grab tensile tests using two types of specimens and three alternative types of testing machines. The grab test procedure in this test method for the determination of breaking force and elongation is considered satisfactory for acceptance testing of commercial shipments of most woven or nonwoven textile fabrics, and the modified grab test procedure is considered satisfactory for acceptance testing of commercial shipments of most woven textile fabrics, since the procedures have been used extensively in the trade for acceptance testing. In case of disagreement arising from differences in reported test values when using this test method for acceptance testing of commercial shipments, the purchaser and the supplier should conduct comparative tests to determine if there is a statistical bias between their laboratories. Competent statistical assistance is recommended for the investigation of bias. As a minimum, the two parties should take a group of test specimens which are as homogeneous as possible and which are from a lot of material of the type in question. The test specimens should then be randomly assigned in equal numbers to each laboratory for testing. The average results from the two laboratories should be compared using Student’s t-test for unpaired data and an acceptable probability level chosen by the two parties before testing is begun. If a bias is found, either its cause must be found and corrected, or the purchaser and the supplier must agree to interpret future test results in light of the known bias. This test method is not recommended for knitted fabrics because of their high stretch. IPS conditions samples at 50% RH and 23° C.